Early space colonization was conducted by national interests and remained tied to their host countries for many decades. But during the political instability of the late 21st century, many colonies lost their ties to their host nation, some of which even carried out joint colonization to produce settlements not connected to any earthbound nation. 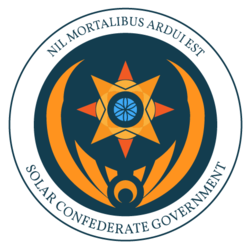 The Solar Confederate Government is a former branch of the United Nations created to police and administrate these colonies, as well as later colonies created by corporate or scientific interests. It has since grown to include all Earth nations and the majority of humanity's colonized systems. While association in SolGov is technically free and open to termination by either the confederate government or the state itself, the fact is that most states depend on imports from elsewhere to survive, and leaving the SolGov military and trade union is not a decision made lightly or often. The main body of SolGov is the Colonial Assembly, located on Luna. It is composed of two councilors from each member state. Councilors are chosen by the member state by any process chosen by the member state itself, be it direct elections, representative elections, top-down appointments, or even blatant bidding wars. In turn, the Colonial Assembly issues confederate laws and mandates and appoints among themselves the various members of the Cabinet. The Colonial Assembly is a highly prestigious house of legal power and the position of a Councilor is an envied one. A Counselor needs to be at least forty years old, be a SolGov citizen, have no felony criminal charges levied against them, and be impartial and incorruptible… a standard that is not always met. Corruption is present inside the Assembly, like in any large governmental body, although many disagree on its exact extent. The Confederate Cabinet is the executive branch of SolGov, considered to be subservient to and controlled by the Assembly. There are more than two dozen Cabinet members, called Executives, each overseeing the agencies involved in such broad sphere of influence as Labor or Foreign Affairs. Cabinet members are appointed by the Assembly and subject to recall by a majority vote of the Assembly, but hold their positions until recall, death, or retirement. The other important body is the Colonial High Court, set up to deal with legal disputes among the member states and to properly judge any criminal who has committed crimes against sapient rights. They deal with violations of the Five Points of Human Sanctity, gross violations of civil rights, and major terrorist organizations. High Judges are appointed by the Colonial Assembly, although Cabinet members and and Councilors are barred from being appointed High Judge. Candidates for High Judges are often highly renowned lawyers and judges known for their keen sense of justice and legal skill. States must meet a minimum level of legal and political stability, population, industrialization and economic strength, adherence to SolGov law, and military strength before they are considered full member states and allowed representatives in the Assembly. These criteria are assessed by an independent commission overseen by the Executive of Development. Any state that does not meet these criteria is considered a Protectorate. While they enjoy the protection and social security of SolGov, they are not represented inside the Colonial Assembly. While one of these criteria is independence from any foreign government or single corporate entity, in practice corporations, being integral to the economic development of most states in SolGov, have a great deal of power over which Protectorates are elevated and which languish. Should a state break the laws set by SolGov or refuse to pay taxes and provide military support to their neighbors, the Colonial Assembly has the option of putting the state on trial. If the High Court finds the government inept, the state's government is dissolved and replaced with a restructured one, usually in the mold of SolGov itself. While this maintains freedom from the worst excesses of corporate oligopoly, state capitalism, or even neo-feudalism, this clause is commonly cited as a gross overstep of Confederate authority. Some states have seceded before being tried, although the economic effects are usually severe enough that they reconsider. It is the duty of a member state to surrender some of their wealth to provide monetary support to poorer member states, and to finance the functionaries and agencies of SolGov. This redistribution of wealth is the life vein for many frontier settlements, as the initial start-up of colonies is an expensive undertaking and relying on corporate support can be risky, and is viewed by many to be unethical, likely to leave a nascent state a corporate puppet. SolGov offers freedom and monetary support - although members are required to eventually pay off their debts, and cannot voluntary leave SolGov during their indebtedness without an appeal before the Colonial High Court. There have been allegations that government officials of some protectorates may keep their colonies artificially impoverished, in order to continue exploiting SolGov backing to line their own pockets. Another duty is to provide for the common defense by maintaining a Defense Force in keeping with the state's population and economic base. This requirement is notably waived for Protectorates, who are guarded by nearby Defense Forces and the central military. Nearby states are free to collaborate to produce a shared Defense Force, most notably with the various states of Earth, Mars, and elsewhere in the Sol System, who all contribute to the Sol Defense Force. This clause makes it easy for collections of small states to meet the defense requirement and thus become full members, which has led to accusations of stacking the deck in favor of Sol, Tau Ceti, and other core systems. In the event of a major military crisis, the Defense Forces are nationalized under the command of the Sol Defense Force. This happened most recently during the SolGov-Hegemony War of 2508-2520, and before that during the Third Cold war. One of the most commonly acted upon duties of SolGov is that of keeping the peace between its member states. This is not to say that any state under SolGov are engaged in open war, but there are still internal conflicts that arise. SolGov has ambassadors and peacekeepers that it sends to member states to attempt to seek peaceful resolution. Ambassadors may not be tied to any of the entities within a conflict, and must remain as neutral as possible. The success of ambassadors and peacekeepers varies greatly depending on the source of the conflict. The duty of SolGov's military forces is singular: Protect the boundaries of human space and the members of SolGov. A purely reactionary force, they protect member states and protectorates from foreign incursions and attacks, such as pirates, non-SolGov Human states, or significant alien threats. For SolGov's own military forces to act freely, the member must notify the Assembly that they cannot handle the threat on their own. Fighting between member states is both heavily frowned upon and very rare, usually incurring domestic sanctions that force the belligerents to a standstill - however SolGov refrains from interference into small conflicts militarily unless there is pressing reason to do so, such as the possibility of war crimes. SolGov's military is separated into three branches, each of which serves a different purpose. SCG Marine Corps: The Solar Confederate Government Marine Corps is a fast-reaction ground force that is deployed by Sol Military Command when severe ground based resistance is met. They pride themselves on their record of siege-breaking and riot ending, a reputation that has, on occasion, convinced troubled groups to reconcile from just the threat of Marine deployment. Occasionally referred to (mostly by themselves) as SolGov's Peacekeepers. The SCG Marine Corps is comparatively small, and used for troubleshooting, deployed in situations where the local Defence Forces are unable or unwilling to take action. The SCG Marine Corps does not accept non-humans, or recruits with prior service, demanding complete loyalty to SolGov and the Corps first, and all other concerns second. The Corps has a perfectionist bent, made only worse by the fact that they are the most well known of SolGov's ground forces. SCG Fleet: The collective term for the warships counted in the SolGov military, and the individuals who crew and service those ships, the Solar Confederate Government Fleet is the largest collection of warships in human space. The Fleet acts mostly as transport for other assets, namely Marines, as the weaponry on even the smallest Fleet ships can easily surpass acceptable damage levels. Though based on Luna and comprised mostly of Sol Native humans, their expenses come almost entirely from member state taxation. Parts of the Fleet are often involved in anti-piracy or anti-Vox actions, which justifies to many the cost of arming and maintaining warships. SCG Defense Forces: Claiming control of the local military forces for any SolGov colony, the Solar Confederate Government Defense force technically answers to the Sol branch, though outside emergencies the local branches are mostly left to their own devices. Defense Force assets remain in their home systems unless rallied by Sol proper. This helps lower SolGov's costs, as well as unrest among colonials, while still allowing enough manpower to mount a strong defense in times of need. Member states are free to choose their methods of recruitment, even including non-humans. The majority have volunteer service, but in some less stable areas selective service has been enacted.